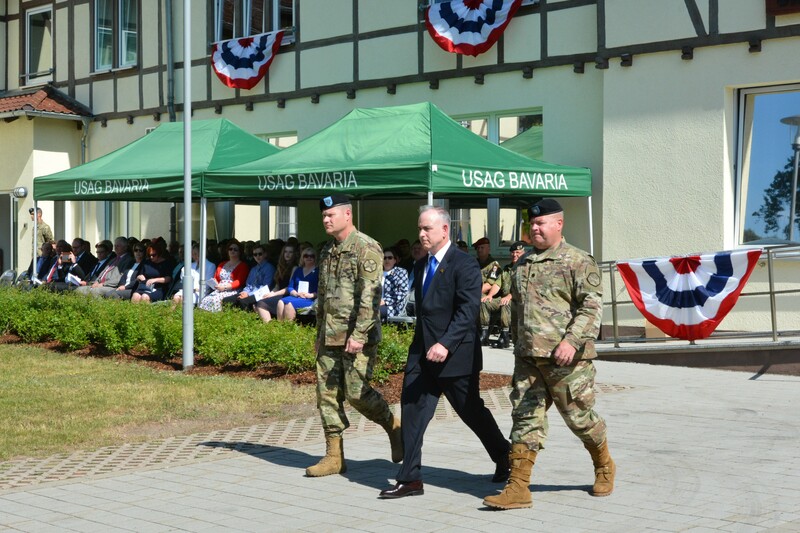 GRAFENWOEHR, Germany -- Col. Lance Varney, garrison commander at U.S. Army Garrison Bavaria, relinquished command at a ceremony here May 22. The ceremony and passing of the command's colors was presided over by Michael D. Formica, region director, Installation Management Command Europe. Varney assumed command of USAG Bavaria July 5, 2016. 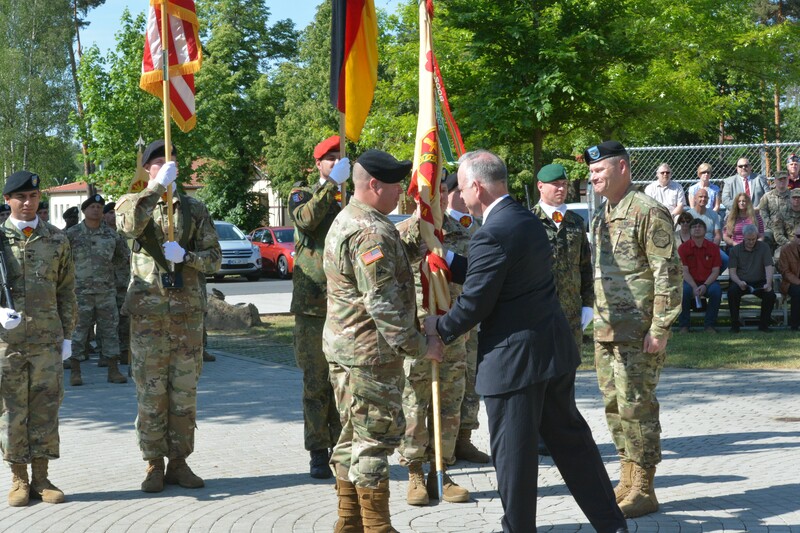 Just prior to his arrival, European Command had announced in March 2016 that it would begin receiving continuous troop rotations of U.S.-based armored brigade combat teams to the European theater as part of the European Reassurance Initiative -- troop rotations that received continuous support from Varney and USAG Bavaria. "I need to say that I have simply loved being part of this garrison," Varney said in his final remarks as garrison commander. "It far exceeded my expectations and has been the highest honor of my career thus far." 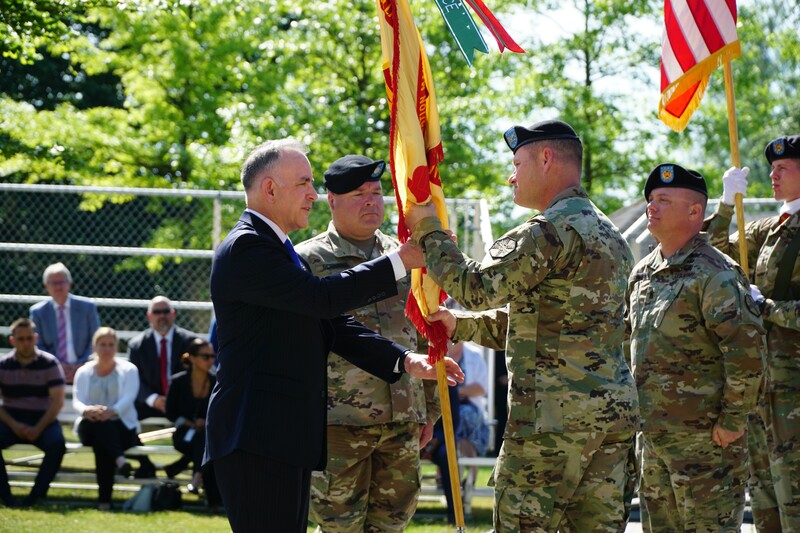 "Focusing on the Army's number one priority of readiness, Lance (Varney) provided strong leadership from day one to reinforce U.S. Army Europe's evolving mission -- here and toward the East," Formica said. Varney paid special tribute to his family, the German-American partnerships, Installation Management Command, mission partners and the garrison team. During his tenure as garrison commander, Varney oversaw major initiatives aimed at reshaping the garrison. Specifically, he allocated support and service to rotational troops at the camps, later dubbed the "Fifth Community." He created the "One Garrison, Five Communities" transformation through a hub-and-spoke concept, which provided resources and staff from the hub in Grafenwoehr to the spokes at Vilseck, Hohenfels, Garmisch and the camps. Another accomplishment shaping his legacy was the creation of his Long-Range Plan, which has served as a framework to improve garrison services, ensure community security and enable U.S. Army readiness. "His vision delivered a Long-Range Plan to synchronize training and operation requirements as part of the garrison's mission," Formica said. "At the same time, he ensured that his team of professionals remained focused on quality-of-life priorities." Varney walks away from the garrison having launched the Bavaria Health Initiative to tackle unhealthy lifestyles across the Bavaria footprint and having stood up Installation Management Command and Europe's first Service Culture Center for employees -- an IMCOM best practice. "I wish to thank our garrison workforce," Varney said. "It has been and will ever be you who accomplish our mission. You have made this garrison 'The Home of Strong Europe Readiness,'" he said, referring to a vision he coined and echoed throughout his time here.